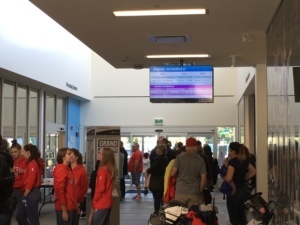 One of the biggest challenges to operating a community center with 15 rooms in this facility is directing the flow of visitors. From change rooms to Community rooms. Moreover, the town of Oakville needed a solution that was easy and simple to use. MyMedia’s MyBooking App made it simple and easy for the facility coordinators to ent er their events to each room. We decided to locate the screens hanging from the ceiling – back to back facing South and north entrance. 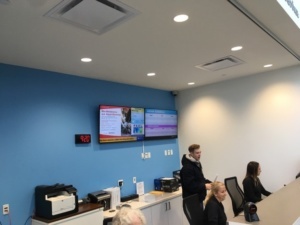 In addition, two screens behind the customer service desk as most people would look there for directions to their event. The fifth Digital signage screen was installed in the concession stand. We created a little application to allow the user to easily uploaded spreadsheet a media uploader which populated a template with all content on the menu items and pricing. This allowed the facility operators to easily updated pricing simultaneously to all items.